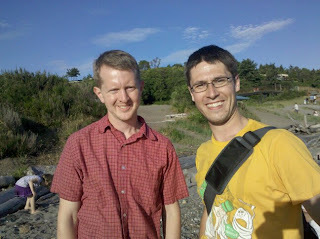 Question: Who is the multi-millionaire Jeopardy champion who I met while at the beach? Correct! $2000 coming your way. But wait, there's more to this Jeopardy answer. Several weeks before that fated beach excursion, I was on the sales floor at Target. I helped someone carry out their patio furniture when I saw a vaguely Jeopardy-champion-shaped-blob off in the distance. Although the sighting lasted roughly three seconds, I knew I spotted greatness. I'll take Jeopardy Stalkers for $600, Alex. And that greatness caused me to start freaking out and doing some sort of weird convulsion. The patio-furniture-person raised an eyebrow, so I needed to explain the greatness we just encountered. “Do you ever watch Jeopardy?” I asked in a one-word chunk. “Not really... why?” the slightly bored looking middle aged housewife responded with slightly less enthusiasm than I exhibited. “... ooooooh, well, that's cool, I guess... but how'd you know it was him? I could not respond to that. All conversation effectively ended at that point. I didn't even offer her a “Do you want this gazebo to not scratch your bumper?” I just did. However, merely letting my “interaction” be three seconds long wouldn't suffice. I went on Ken's blog and got his email address. I asked him if that was indeed him at that Target on that day. He quickly responded that it was him, because he needed to buy LEGOs, because his kid was going to a birthday party. Success! Case closed. I had seen greatness. But most Targets are not located on beaches, and that leads to part two of the story. About three weeks after that incident, I rode my bike around town. I initially planned to ride along the prostitute-strewn area of Seattle, but you know what they say about those ladies when in heat—avoid. Instead, I went to a local beach. Seconds after parking my bike and treading over roughly 10 feet of sand, I looked to my right and once again saw the "Brainiac," the "Maphead," the KenJen. Of course, I did recognize him, but it couldn't be him. He had appeared in public and nobody mobbed the man who made Jeopardy interesting to watch. He merely just sat there, with his family. A guy sitting next to him didn't even cast a sidelong glance at the terror of Alex Trebek. Practicing the same reserve I displayed three weeks beforehand, I freaked out again. Luckily I could pawn it off as excitement for the beach (ooooh, cold water!). But I couldn't convince myself to go up to him. 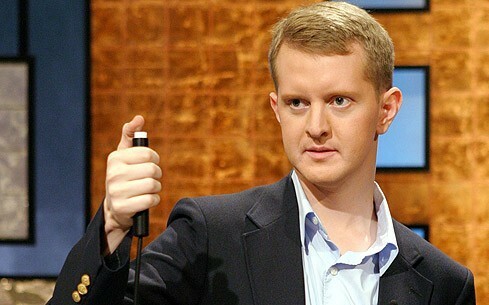 Sure we had corresponded, but it seemed like such a different world when Ken Jennings was just hanging out on a public beach with his family. It took numerous unanswered texts to my friends to find out if I should go up to him to get me to go up to him. As anyone who did watch his run should know, he was incredibly cool. He had no problem letting me take a picture with him or giving me 14 percent of his winnings, which he just happened to have in his wallet. Well, that last part didn't happen, but at least I walk away with a story and an amazing picture.